Unlike Giraldus, Yeats’s Kusta ben Luka is based upon an actual historical figure, apparently offered as appropriate for his purposes by Sir Edward Denison Ross. Yeats seems to have fixed upon an Arabian setting within a month or so of the Automatic Script’s start (see the Judwalis), and had gone to see the distinguished Orientalist in London in December 1917. When Frank Pearce Sturm questioned the transliteration in October 1924, it is clear that Yeats had told him that the source was Ross, since Sturm replied that: ‘For an Orientalist who knows forty languages to know anything else . . . would be an impropriety, so I forgive him Kusta ben Luki, & accept his version of the name’ (FPS 86). Sturm also mentioned a little of the Kusta’s background: ‘The dog-latinists of the alchemical epicycle of Western thought called your friend Costa ben Luca, but he knew himself as Qusta ibn Luqa of Baalbeck, & was a person of note in his day. Albertus Magnus admires "the books of incantations of Hermes and of Costa ben Luca the philosopher." Kusta wrote many books in his day, of which survives, among others, treatise on Physical Ligatures dealing with the virtue of the mind whereby the physical body is changed & influenced’ (FPS 86). This treatise on amulets appears, as an anonymous letter, ‘De Incantatione et Adiuratione, Collique Suspensione, Epistola Incerti Authoris’, along with Gerardus Cremonensis’s Geomantia Astronomica, in the appendix to Agrippa’s Latin Opera (which was in the Yeatses’ library, YL 24). Suheil B. Bushrui, in ‘Yeats’s Arabic Interests’ (in In Excited Reverie), gives the fullest account of Kusta / Qusta ibn Luqa al Ba’lbakki (as correct as the simple Roman alphabet will allow). However, how much information about the historical Qusta was actually available to Yeats at the time of his writing is open to question, as Warwick Gould points out (in ‘'A Lesson for the Circumspect'’, 277n). Gould allows that Sir Edward Denison Ross could well have been an oral source for information that was not widely available outside the academic community, although Bushrui notes George Yeats’s feeling that Ross did not have a great deal of time for her husband in this matter. Qusta ibn Luqa (820-912 CE) was particularly renowned as a translator into Arabic of Syriac and Greek texts, appropriate to Yeats’s placing his ideas as suggesting ‘some remote Syriac origin’ (AV A xix) or ‘derived like the work of Gyraldus itself from a lost Syriac original’ (YVP 4 17). Other details of his life might have held appeal for Yeats, as he created the figure of his myth. A Melkite Christian, Qusta’s name is a version of ‘Costas/Constantine, son of Luke’ and he came from Baalbek, called Heliopolis in Greek since its famous Temple of Baal was identified with the cult of the Sun. He was one of the most distinguished of the scholars of the Abassid Bait-ul-Hikma or ‘House of Wisdom’ founded in Baghdad by Harun al-Rashid’s son, Caliph Al-Mamun in 830 CE. As both a translator and author he made an important contribution to the Islamic efflorescence of the first millennium, and in part he therefore also helped to preserve some of Hellenistic culture for its later rediscovery in mediæval and Renaissance Europe. He is credited with forty translations and some forty original works (some sources give 63 as the number), some of which came to influence Western Europe mainly through the efforts of the Spanish translators. Illumination from manuscript of De Differentia Spiritus et Animae by Qusta ibn Luqa, Harley MS. 3487, British Library. The earliest work by Yeats to feature Kusta ben Luka was the narrative poem ‘Desert Geometry or the Gift of Harun Al-Rashid’, which was first published in 1924, linking Kusta with the semi-mythical Caliph of the Arabian Nights; it is an orientalised and fictional account of Kusta/Yeats and his young bride/George, who reveals unknown truths to her husband while she is in a sleeping trance. Yeats was aware that the dates of Qusta ibn Luqa (820-912 CE) and Harun al-Rashid (ruled 786-809 CE) did not coincide, at least once Frank Pearce Sturm had written to him in 1924, without exact dates but indicating that while the ‘Caliph died in 809. Kusta was still hard at work with his pen in 866’ (FPS 83). The story which he presented in A Vision A (1925) already seems to have taken the discrepancy into account, since the framing fiction at the beginning has an old Kusta and a successor of Harun in place of the dramatis personae of ‘Desert Geometry or the Gift of Harun Al-Rashid’, which still appears, though (see the Two Editions for the placing of the contents). Warwick Gould shows that in drafts Yeats ‘proposed but cancelled Shahryar’, the name of the Caliph who was told the stories of Harun by Sheherazade (see comment on the Arabian Nights in the Judwalis’page); he then ‘substituted the historically identifiable El-Mukledar’, probably for Al-Muqtadir who acceded in 908, but finally opted for vagueness over detail (‘'A Lesson for the Circumspect'’, 252). The anachronism in the poem was corrected, inaccurately, in A Vision B (1937), where John Aherne notes drily that Kusta ‘was a young or youngish man when Harun Al-Rashid died. However, poetic licence may still exist’ (AV B 54). Among the works that Qusta ibn Luqa translated were ‘Hypsicles. . . Theodosius’ Sphaerica. . . Heron’s Mechanics, Autolycus, Theophrastus’ Meteora, Galen’s catalogue of his books, John Philoponus on the Physics of Aristotle and several other works, and also revised the existing translation of Euclid’ (How Greek Science passed to the Arabs, 170). In the judgement of someone coming shortly afterwards, al-Nadim (d. 990s CE; also an-Nadim), who compiled Kitab al-Fihrist (‘The Book of the Catalogue’), an index of all books written to ca. 987 in Arabic, Qusta ibn Luqa ‘was skilled in translating and had a good literary style in Greek, Syriac and Arabic. He translated some things and corrected many [other] translations.’ (The Fihrist of Al-Nadim, 588). Al-Nadim in fact personally placed Qusta even above Hunayn ibn Ishaq, who is generally regarded as the greatest of the translators of the Bait-ul-Hikma, ‘because of [Qusta’s] excellence and genius’, though ‘[b]oth men were of a superior type’. His original works, many listed in the Fihrist of al-Nadim, dealt with contemporary science, medicine, astronomy and philosophy. A Latin translation of his work ‘On the Difference between the Spirit and the Soul’ (De Differentia Spiritus et Animae) was one of the few works not attributed to Aristotle that was included in a list of ‘books to be 'read,' or lectured on, by the Masters of the Faculty of Arts, at Paris in 1254,’ as part of their study of Natural Philosophy, (J. A Burns, article on ‘The Faculty of Arts’ in The Catholic Encyclopedia, Vol. 1, [NY: Robert Appleton, 1907], 758). This translation was made by Joannes Hispalensis, (John of Seville, fl. 1140), and George Yeats had copied a note from W. W. Skeat’s edition of Chaucer referring to Joannes’s own original work, the Epitome Totius Astrologiae (written 1142; published in print, Nuremberg, 1548), concerning the Mansions of the Moon in ‘The Franklin’s Tale’ (see CVA notes 10). There is, therefore, the possibility that one of the Yeatses came across a reference to the Latin translation of Qusta ibn Luqa when looking for this astrological treatise; the contemporary British Museum catalogue, for instance, listed a nineteenth-century edition of this work under the heading of Joannes Hispalensis. It seems unlikely that Yeats would ‘have met Costa ben Luca . . . in Robert Burton’s Anatomy of Melancholy’ (as suggested in CVA notes 6) where his name appears only once ‘hidden’ in a long list of authorities. There are other works by Qusta ibn Luqa which might have interested Yeats. Yeats refers to Alfonso X of Castile and Leon in the context of various systems of spheres in the Card File (E1, YVP 3 297), and the king’s physician, Jehuda ben Moses Cohen, translated Qusta’s Libro de la alcora into Castilian in 1259; his title for this treatise on the astrolabe and celestial spheres translates as ‘The Book of the Shape of the Sphere/Astrolabe and its Figures and its Operations which is called The Book of the Sphere/Globe’. (For further references on the thirteenth-century School of Toledo, see Suzanne H. Petersen, Alfonso X, el Sabio, Escuela de Traductores, ‘Scientific Works: Christian and Jewish Translators’.) One final work is worth commenting on as certainly the most suggestive for Yeats’s purposes, A Book on the Causes of the Differences which Men Display in their Characters, in their Behaviour and in their Passions and Inclinations. However, it is not a well-known work and if there is any direct influence it would have to be invoked through the figure of Edward Denison Ross, since it is not mentioned in the Fihrist and was not published in a European language until 1941, as ‘Le livre des caractères de Qostâ ibn Loûqâ’. This work deals with the question of why similarities of intelligence and judgement do not lead to similarities of character and behaviour, while there are similarities of character between people who do not have the same intellectual endowments. Qusta’s explanation is decidedly natural, resting largely on physiology and the temperament of the brain, heart, liver and testicles, but the title at least could have made Qusta appear as a good candidate for Yeats’s Arab writer on ‘typal man’. Yeats might also have been attracted to the figure of Qusta as a Christian in the Muslim world, both outside the main culture and also at its heart, saving part of the heritage of Greece and Byzantium by transmuting it, placed in hall of mirrors where ‘all must copy copies’ (VP 556). Certainly the myth that he created surrounding A Vision in 1925 is partly one of tradition and transmission, the loss of knowledge and its rediscovery or reconstruction. Two of the best-known examples of writers whose works exist now only in tantalising fragments, are the lyric poet Sappho, who was called the tenth muse in her day, and the pre-Socratic philosophers in general, of whom Parmenides is one of the more renowned since one of Plato’s dialogues is named after him. They come together in the poem of ‘The Gift of Harun Al-Rashid’, when the fictional Kusta decides about where to have his letter secreted once it has been read by its recipient: since it is a love-story he thinks first of ‘the great book of Sappho’s song’, but decides that it will find more favour with those who go to study the ‘Treatise of Parmenides’, presumably Parmenides’ lost hexameters On Nature. He is happy with such a hiding place, ‘for Caliphs to world’s end / Must keep that perfect, as they keep her song, / So great its fame’ (AV A 121; VP 461) and so assure their permancence. Yeats, the puppeteer-creator, is aware of course of the proleptic irony of Kusta’s choice, since neither of these works survives: ‘Gibbon says that the Poems of Sappho and the Treatise of Parmenides were extant in the twelfth century, and it does not seem impossible that a great philosophical work of which we possess only fragments, may have found its way into an Arab library of the eighth century’ (note; VP 829). Parmenides’ work will, though, eventually be lost from the libraries of vanished Caliphs, as too will Sappho’s song. In a similar way, Yeats has the Sacred Book of the Judwalis ‘lost or destroyed in desert fighting some generations before’ the time of the old man whom Robartes met (AV A xix). Even Giraldus’ work has been mutilated in order to make a fire and then used to prop up a bed when Robartes finds it, so that he is left with tantalising fragments and indications of what the whole work must have been. The Judwalis’ doctrines are laid out in the sand, to be obliterated as soon as the first wind comes along; only the oral tradition keeps the wisdom intact. 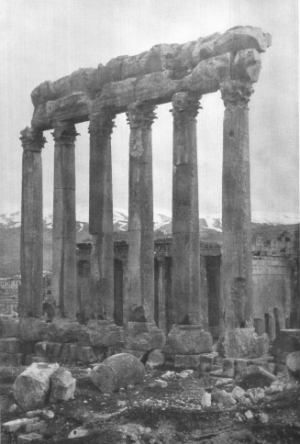 ‘Columns of the Temple of Jupiter, the Temple of Bacchus, and the snow-capped range of Anti-Lebanon, Baalbec’, from Robert Hichens, The Holy Land (1910). The Judwali had once possessed a learned book called ‘The Way of the Soul between the Sun and the Moon’ and attributed to a certain Kusta ben Luka, Christian Philosopher at the Court of Harun Al-Raschid, and though this, and a smaller book describing the personal life of the philosopher, had been lost or destroyed in desert fighting some generations before [the old man’s] time, its doctrines were remembered, for they had always constituted the beliefs of the Judwalis who look upon Kusta ben Luka as their founder. It is likely that a general idea for the title of Kusta ben Luka’s work on the gyres was thought up by Yeats, who then asked Denison Ross for an Arabic translation and transcription. Certainly the version of the title which he used in some drafts is recognisable though problematic, since Suheil Bushrui has pointed out that the form does not follow Arabic practice of rhyming titles (‘Yeats’s Arabic Interests’, In Excited Reverie, 300-02). In a draft from 1920 (the ‘Version B’ of YVP 4) Yeats writes of ‘the TARÎQAT UN-NUFUS BAYN AL-QUMÚR WA’L-SHUMUS or The Way of souls between the moon & sun which [is] mentioned in one of the other books of Kusta ben Luki but seems to have dissapeared’ (NLI 30,525; YVP 4 143), which is translated in a later manuscript as ‘the Way of souls between the Moons & the Suns’ (YVP 4 70). The Arabic title never appeared in print and even the English translation was dropped in AV B. It is plausible that the title of Kusta ben Luka’s invented work is an amalgam of W. T. Horton’s The Way of the Soul (YL 920) and Cecil French’s Between Sun and Moon (YL 712) as Harper and Hood suggest (CVA notes 6; repeated YVP 4 notes 49), but the latter was only published in 1922 and Yeats used Kusta’s title significantly earlier. Horton’s influence is certainly important, but it is also worth noting that the Yeatses’ library in the 1920s included a rather more appropriate work, J. Henry Van Stone’s The Pathway of the Soul: A Study in Zodiacal Symbology, and that the Sun and Moon were part of the Instructors’ symbolism from the very first. There is another possible inspiration, in the elusive title of a lost Nabatean/Arabic work from ca. 900 CE by Ibn Wahshiyah, Sun of Suns and Moon of Moons, mentioned in one of the stranger books from the Yeatses’ library, Ancient Alphabets and Hieroglyphic Characters Explained (YL 832 and in the 1920s list). 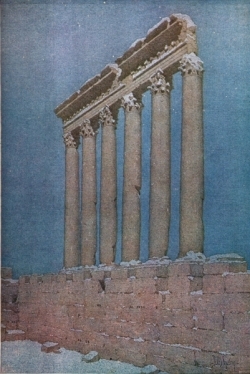 ‘The Columns of the Sun, Baalbec’, from Robert Hichens, The Holy Land (1910), by Jules Guérin. The following ideas, developing from this last reference, are rather more speculative, and can be ignored by those who find such matters otiose. Ahmad bin Abubekr bin Wahshih, nowadays transliterated as Abi Bakr Ahmad Ibn Ali Ibn Qais Ibn Wahshiyah, was known as ‘al-Kaldani’ from his birthplace in Iraq/Chaldea and ‘al-Nabati’ (or ‘an-Nabati’), the Nabatean, because of his supposed descent from the desert people of Petra. He wrote and translated works on toxicology, agriculture and botany, as well as alchemy, magic, astrology and the secrets of the hieroglyphs. He had achieved renewed prominence in the nineteenth century on account of his Nabatean Agriculture (Kitab al-falaha al-nabatiya, ca. 900 CE), which contains interesting ethnological information on a wider range of topics than the title promises, and is allegedly translated from an ancient Babylonian writer called Kúthámí, extolling the pre-Arab, and pre-Islamic, civilisation of the region. Fuelled by Burckhardt’s ‘rediscovery’ of the Nabatean city of Petra in 1812, interest in the culture had grown and the Nabateans were seen by some, including the great Russian Orientalist, Daniil Avraamovich Khvol’son (Daniel Chwolsohn or Chwolson), as the descendants of the original builders of Babylon and the ancestors of the mysterious Sabians. The Sabians are mentioned in the Koran as a people of the book, therefore enjoying some tolerance under Islam, and their identity was apparently appropriated by the star-worshippers of Harran (Carrhae), a city famed for its temple to the Moon-god, Sin. Suheil Bushrui considers that it is the ‘Sabians or Harranians, who must have been at the back of Yeats’s mind when he described the Judwalis’ (In Excited Reverie, 298). I do not agree with this, as is clear in the page on the Judwalis but, in the end, the difference is relatively minor. In 1835, the French scholar Etienne Quatremère, was the first to collate the relevant source-material in an attempt to clarify the identity of the historical Nabateans. He dated the supposed Babylonian original of Ibn Wahshiyah’s translation to the reign of Nebuchadnezzar II (ca. 600 BCE). Daniel Chwolsohn went far further back, putting it at 1300 BCE and containing internal references that indicated a continuous written culture dating back thousands of years earlier in time. He therefore viewed Nabatean Agriculture as a unique receptacle of immemorially ancient customs. Yeats could have come across The Nabatean Agriculture through Madame Blavatsky’s references to it in The Secret Doctrine, since it remained otherwise untranslated into English. She deals with the debate over the work at some length, ‘because it has an important bearing upon a great portion of the present work’ (2: 454) not least because of its possible antiquity, and cites with approval Chwolsohn’s belief that: ‘that archaic volume is “a complete initiation into the mysteries of the pre-Adamite nations, on the authority of undeniably authentic documents.” It is “an invaluable compendium, the full epitome of the Doctrines held, of the arts and sciences not only of the Chaldeans, but also of the Assyrians and Canaanites of the prehistoric ages.” These “Nabatheans”—as some critics thought—were simply the Sabeans, or Chaldean star-worshippers’ (2: 452-53). She regards it as ‘the Secret Doctrine under the exoteric Chaldean form of national symbols, for the purpose of “cloaking” the tenets’ (2: 455). She acknowledges that critics such as Renan dismiss it as a forgery, and that others find its account of its provenance no more than fairy tale, since the contents were supposedly ‘originally told by Saturn to the Moon, who communicated them to her idol, which idol revealed them to her devotee, the writer—the adept Scribe of that work—Qû-tâmy’ (2: 453); Blavatsky, of course, dismisses such criticisms with lofty contempt. Perhaps most significantly with regard to Yeats, she uses it to examine the ‘Sabean’ conception of dualism with reference to Solar-Lunar worship and the axiom ‘Demon Est Deus Inversus’, the formulation that so resonated with Yeats that he adopted it as his motto in the Golden Dawn. and Yeats sees Christianity as the return of Babylonian values and its oxymoronic nebulous precision, combining ‘Asiatic vague immensities’ (VP 610) and the scientific ‘log-book of the sun’s journey and the moon’s’ (VP 480). At one stage in 1929, the normally enthusiastic Frank Pearce Sturm discerned such Babylonian pedantry in A Vision itself, and warned Yeat that he feared: ‘Some dead & damned Chaldean mathematikoi have got hold of your wife & are trying to revive a dead system. . . . All these gyres & cones & wheels are parts of a machine that was thrown on the scrap heap when Ptolemy died. It won’t go. There is no petrol for such’ (FPS 99). This figure is expressive of the most sublime secret, called originally Bahumed and Kharuf (or calf), viz. The Secret of the nature of the world, or The Secret of Secrets, or The Beginning and Return of every thing. To speak at length of this figure, is more than the limits of this book allow. We refer the curious, who wish for more explanation, to a book, which we have translated from our Nabathean language into Arabic, and entitled: Sun of Suns and Moon of Moons, illuminating the discovery of the Hermesian alphabets, or hieroglyphics, where he will be completely satisfied. Hammer, the translator, identifies this ‘Secret of the nature of the world’ with Anima Mundi, and Ernest Renan, in An Essay on . . . the Book of Nabathæan Agriculture, refers to fragments of a book named A work of the Secrets of the Sun and Moon (6), which he considers to be an atheist version of generation myths (72), suggesting that Anima Mundi is conceived of as a non-divine creative power, almost a Gnostic demiurge. For the magician such as Lévi, the Anima Mundi or Astral Light is the ‘Great Magnetic Agent’ through which all magic is accomplished, and which the ‘Gnostics represented it as the burning body of the Holy Ghost, and this it was which was adored in the secret rites of the Sabbath or the Temple under the symbolic figure of Baphomet, or of the Androgyne Goat of Mendes’ (The Mysteries of Magic, 69). To return, finally, to Qusta ibn Luqa: Bushrui’s explanation of Yeats’s choice of Qusta ibn Luqa from ‘his association with the Sabians or Harranians, who must have been at the back of Yeats’s mind when he described the Judwalis’ is definitely a possibility, and the title of his fictitious book may, by circuitous indirections, indicate a nod towards a Nabatean/Sabian source. If this really was his reason, Yeats would later learn of another, possibly more appropriate and slightly earlier translator, Thabit ibn Qurra Marawan al-Harrani (Thebit ben Corah; ?827-901 CE), who actually was a Harranian and was expelled from the city for some form of sacrilege (see FPS 84, 86-87). This would surely have appealed to the creator of Robartes and Aherne, but possibly by then he was already committed to his first choice of Qusta/Kusta.